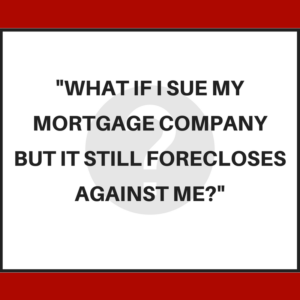 What if I sue my mortgage company but it still does the foreclosure against me? What if I sue my mortgage company but it still forecloses against me? In another article, we talked about whether or not bankruptcy was the only option when you’re facing foreclosure. Today, we would like to follow that question up with the best way to handle a foreclosure without going through the life-altering process of bankruptcy. Sue your mortgage company before the foreclosure takes place. When they tell you the foreclosure date, be sure to file your lawsuit before that date. We recommend that you check your mortgage. There should be a clause that gives you the right to go to court and tell the judge that you have defenses against this foreclosure. Then you let the court decide whether or not the foreclosure should happen. We followed the rules. Your mortgage (most anyway) explicitly allow you to sue to have a judge decide. Sometimes the mortgage companies will do it anyway. Even some foreclosure lawyers will do it. If they do this, the first thing you need to do is get in touch with the foreclosure lawyer and get them to fix it. They’ll try to argue with you and tell you that it’ll be complicated because of one excuse or another. Be firm. Let them know that you don’t care if it’s difficult, they need to fix this mistake. Then, you’ll need to get in touch with your mortgage company and let them know that they need to fix this mistake as well. In addition, they need to explain how this could have happened. This part is done through the right type of letters, which we talk about in other articles. Afterward, you’ll go to court (because you’ve already sued your mortgage company) and tell the judge about what the mortgage company has done. You can ask the judge to set the judgment aside after you explain what happened. You should also reach out to any third party involved, let them know that there was a lawsuit going on with the property, and urge them to tell the mortgage company to fix it. They need to let the mortgage company know that they want this mess fixed also. If the mortgage company still refuses to undo the foreclosure, then we will need to gather up all of our defenses and go to court with the mortgage company. We may also want to look into suing the mortgage law firm. They may have violated the FDCPA (Fair Debt Collection Practices Act), or maybe they have violated the state law. Unfortunately, we can’t explain why they would be idiotic and foreclose on you. However, when you do sue them, make sure that you have all your information together and that every party involved is in the court. Ultimately, it’s up to you to decide how you handle your foreclosure. However, the worst thing you can do is ignore the situation. The way we handle mortgage companies that foreclose on consumers is by going after them. There’s no excuse for them to foreclose on consumers if the mortgage company has been sued by the consumer before the foreclosure. If you don’t sue them before the foreclosure happens, then they get to make their excuses. But if you sue them beforehand, then the mortgage company loses all of its excuses. It’s interesting to watch the mortgage company scramble and explain how this mess could have happened. The point is, it’s possible to undo a foreclosure. This article is longer than usual, and it may seem like we’re ranting, but we want you to understand that you can get out of a foreclosure in Alabama. If these guys are acting crazy, you have to fight back and set them straight. Once we’ve undone the foreclosure, we need to figure out the damages that the mortgage company has done. How have they harmed us? Well, they foreclosed on us, they messed up my credit report by putting false information on it, and caused emotional stress for us because they ignored our rightful lawsuit and foreclosed anyway. The mortgage company should pay for those damages because it’s their mistake. Actually, not a mistake — an intentional deliberate act. This was no accident — they fully intended to foreclose even though you sued before the foreclosure. Outrageous conduct by the mortgage company needs to met with fire and fury. If you’ve already retained a lawyer, definitely get in touch with them and get a game plan together with them. If you live in Alabama and you have any questions about what we’ve talked about, feel free to get in touch with us.